Incorporate a touch of style into your space with the MSI Carrara Polished Porcelain Floor and Wall Tile. A perfect complement to any contemporary aesthetic, this elegant, white rectangular tile blends the look of natural stone with porcelain durability and a high-sheen polished surface to help brighten your decor. Suitable for medium-duty commercial or residential floors and walls with minimum maintenance, the tile incorporates a distinctive personal signature in a wide variety of designs. Use matching trim tile or a combination of field tile to achieve the design that best suits your space and preferences. MS International Aria Cremita 12 inch x 24 inch Porcelain Tile features a cream background with natural warm tonal veins. Offering the sought-after look of natural stone, this polished rectangular tile creates a distinct ambiance that sets your home apart from the rest. Its neutral colours complement a variety of design aesthetics and make it the ideal backdrop for nearly any decor. 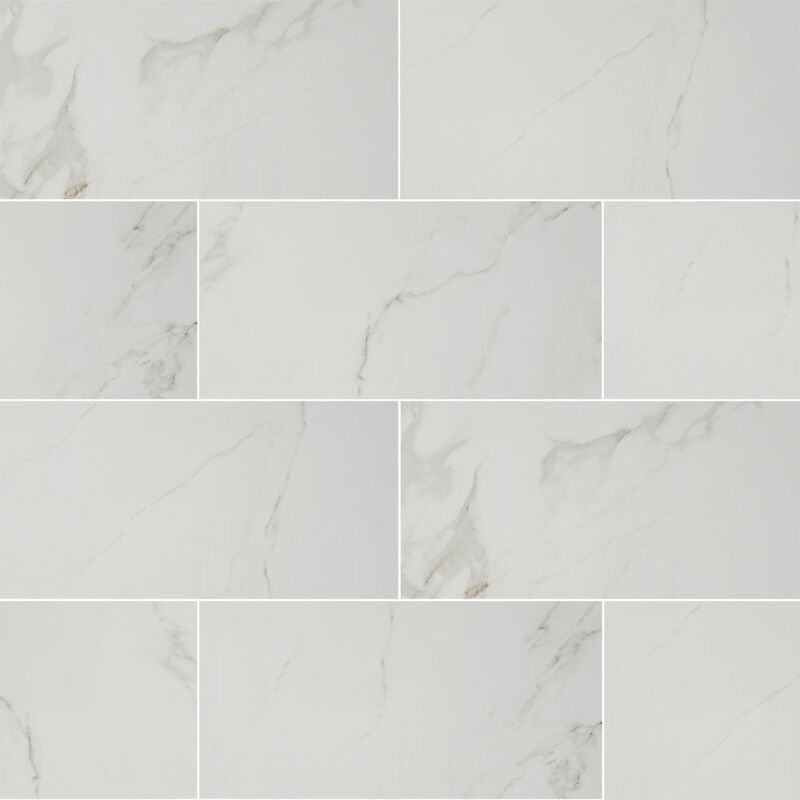 Used for numerous residential applications, including walls, floors, kitchen backsplashes and shower surrounds, this tile is alsuitable for light commercial environments, where it's a preferred wall and backsplash tile. This is a rectified tile, mechanically finished on all sides to achieve uniformity. Its precise sizing allows for a thinner grout joint, which results in a clean, professional install and reduces staining issues. Multiple tile sizes and accessories are available to give your project a finished look. Beton Glacier 12 inch x 24 inch Porcelain Tile in Gray floor and wall tile are constructed from durable, frost-resistant porcelain material with an impervious water absorption, making it a great choice for indoor and outdoor applications. The handsome gray colour, combined with a polished, low sheen creates a stylish, contemporary appearance. Beton Gris 12 inch x 24 inch Porcelain Tile in Gray floor and wall tile is constructed from durable, frost-resistant porcelain material with an impervious water absorption, making it a great choice for indoor and outdoor applications. The handsome gray colour, combined with a polished, low sheen creates a stylish, contemporary appearance. Focus Grey Porcelain Floor and Wall Tile is constructed from durable, frost-resistant porcelain material with an impervious water absorption, making it a great choice for indoor and outdoor applications. The handsome gray colour, combined with a polished, low sheen creates a stylish, contemporary appearance. Carrara 12-inch x 24-inch Glazed Polished Porcelain Floor and Wall Tile Incorporate a touch of style into your space with the MSI Carrara Polished Porcelain Floor and Wall Tile. A perfect complement to any contemporary aesthetic, this elegant, white rectangular tile blends the look of natural stone with porcelain durability and a high-sheen polished surface to help brighten your decor. Suitable for medium-duty commercial or residential floors and walls with minimum maintenance, the tile incorporates a distinctive personal signature in a wide variety of designs. Use matching trim tile or a combination of field tile to achieve the design that best suits your space and preferences. Carrara 12-inch x 24-inch Glazed Polished Porcelain Floor and Wall Tile is rated 4.3 out of 5 by 16. Rated 5 out of 5 by PaintDiva from I was looking for a matte white tile with gray veining. I just didn't like any of the matte versi... I was looking for a matte white tile with gray veining. I just didn't like any of the matte versions - they had alot of brown or blue veining & the texture was not great. I kept coming back to look at this polished porcelain tile. Finally I just had it installed in our downstairs (small townhouse) kitchen area, foyer & small bathroom, all on the same level. It is amazing; looks exactly like white marble with grey veining. We go stand in the kitchen all day to admire it. It's not slippery as the polish would suggest. What I like most is the so-easy-to-clean aspect. I was washing my former tiles every weekend, scrubbing & using bleach. No more. These tiles wipe up with a damp mop or I just use sponges. Mostly I sweep them. That's about it. When you enter my townhouse & see the elegant white polished tiles, it looks stunning. I can't wait till summer when I can leave my front door open (with screen) so that the passersby can admire the gleaming white porcelain finish. The 2 workers did the job in 2 days with an extra half day for the grout to dry; their handiwork was amazing. The grout looks especially nice. The white porcelain tiles really open the areas up beautifully. Rated 5 out of 5 by sjbob from The pattern is subtle and not overpowering. The large tiles make the walls of our small bathroom ... The pattern is subtle and not overpowering. The large tiles make the walls of our small bathroom pop. We couldn't be happier. Rated 5 out of 5 by MikeA from Excellent tile for a shower wall and reasonably priced.... Excellent tile for a shower wall and reasonably priced. Rated 5 out of 5 by HomeDepotCustomer from Easy to install. This tile elevated the look of my... Easy to install. This tile elevated the look of my bathroom. Very Beautiful! Rated 3 out of 5 by HomeDepotCustomer from Some tile is different color not match ? ... Some tile is different color not match ? Thank you for the interest in a MSI product. Carrara Glazed polished porcelain floor and wall tile is recommended to be used on a floor. However, the tiles may get slippery when wet. We suggest obtaining a sample of the tile and testing it wet before installation to ensure it isn't too slippery for your project. Good luck with your project!